I work with patients with carpal tunnel syndrome and have a hard time explaining the condition. Would a 3D wrist model be helpful? Carpal Tunnel Syndrome is one of the most common medical issues of the wrist and hand. Many have heard of the condition, but really don't understand just what it is. Trying to verbally explain the normal structure of the inside of the human wrist is challenging, but also having to explain when things aren't working correctly can be incredibly difficult. The good news is that a 3D wrist model can take most if not all of the stress out of this discussion. 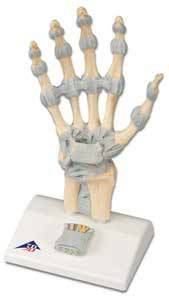 A high quality model will have the interior of the wrist facing forward, clearly showing the bone structure of the hand and wrist as well as the nerve bundle that runs through the wrist. Some models even provide musculature of the thumb, allowing you to further discuss problematic issues with patients. Having the model available helps to put the patient at ease as well. They can point to things on the model to get addition information without having to try to remember medical terminology. This will help with overall communication and establish a great rapport with your patients. Is a 3D wrist model labeled and how does that impact on the model's lifelike appearance? A good quality 3D wrist model will not have labeling on the model itself. The labels do take away from the realistic appearance of the model plus the labels can be very difficult to read when printed this way. A better option is to have a separate card behind the model that clearly shows the names of the specific features of the model. A drawing that duplicates the model in front of the card is also used to help with the identification. How long can I expect a 3D wrist model to last in a teaching environment? With proper care a 3D wrist model will last for years even with daily use in a teaching environment. Look for durable, high quality plastic models that are well designed and manufactured. Plastic models are resistant to fading, chipping and pealing plus they can be easily cleaned with soapy water and a soft cloth. Handling the models will not cause damage provided that appropriate care is used. Are 3D wrist models accurately sized for a normal human hand? Most hand and wrist models are life-size and accurate for the typical human hand. They are also usually representing the right hand. Keep in mind that the 3D wrist model often looks slightly larger simply because there is no flesh visible, just the actual bones, tendons and nerves. Some companies offer the option of left hand models while still others may offer the option of custom design of models. Custom designed models are a good option for working with children or patients that have specific conditions of the hand or wrist. Arthritis models of the hand are a good example of this level of specialization.